From QUAY's extensive range of woodcraft construction kits that have proved highly popular with children and adults alike. From QUAY's extensive range of woodcraft construction kits that have proved highly popular with children and adults alike. These are sturdy wooden models made from pre-cut plywood sheets that come ready to assemble. 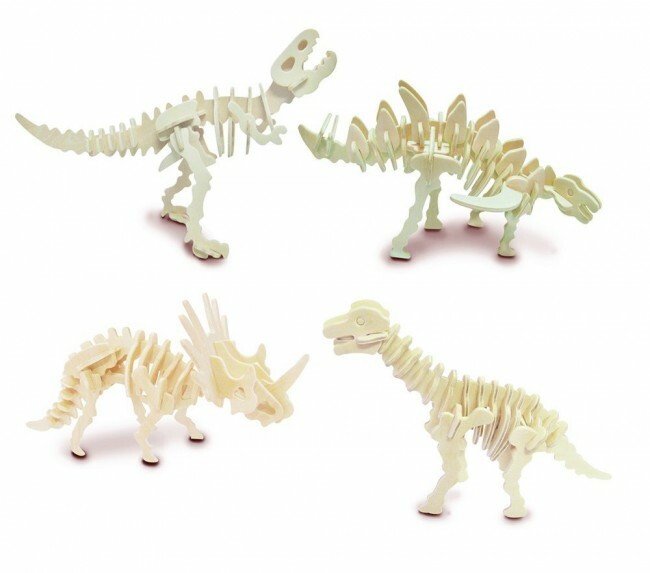 Each model is built by slotting the individual pieces together, following the easy to use numbering system included in each kit. Great educational value and as an alternative to TV and computer games. 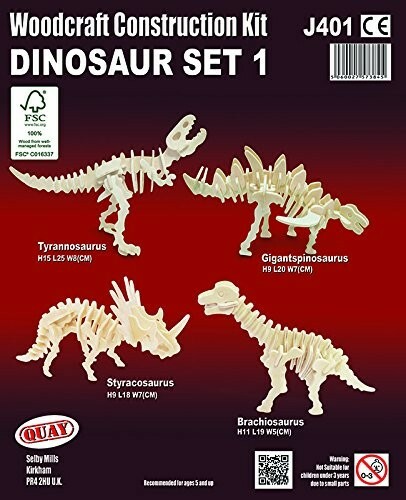 Kit contains 4 models: Tyrannosaurus completed model measures H15cm x L25cm x W8cm Gigantspinosaurus completed model measures H9cm x L20cm x W7cm Styracosaurus completed model measures H9cm x L18cm x W7cm Brachiosaurus completed model measures H11cm x L19cm x W5cm In order to ensure that the wood used in the kits is sourced in a responsible manner, they are FSC PLEASE NOTE THAT THIS IS A MODEL KIT AND IS SUPPLIED UNASSEMBLED. NOTE SUITABLE FOR CHILDREN UNDER 3 YEARS OLD DUE TO SMALL PARTS.